I want to give attention to the simple beauty of the liturgy of Reformed churches. This plainness is not because of a cultural aversion to beauty or sentiment. The popular art and music of Reformed communities express beauty and sentiment in equal measure. Nonetheless the sacred worship services of the Reformed are intentionally limited to the prescribed elements of worship contained in the Scriptures. "Representing God once more, the minister intercedes on behalf of the covenant people who have thus experienced the drama of the exodus again for themselves. They too have passed from death to life in this liturgical drama, from alienation and despair to the assurance of reconciliation and the response of praise from their side of the covenant – and on that basis they enter the Holy of Holies in this semirealized eschatology. With their covenant mediator and advocate representing their case in heaven, the community's intercession is effective, and the people are prepared to hear God's word in the sermon." Finally, the last word of the service is “reserved for God, and his parting word is once more the word of Gospel, as God's blessing is laid upon the covenant people in the benediction.” The structure of this divine service is predicated on the principle that worship occurs in a dialogue between God and his people. The dialogical principle serves several purposes: it simplifies the service by removing any extraneous human inventions, it clarifies the service by assigning a clear role to each partner, and it affirms a covenantal relationship which God makes with his church. Hughes Oliphant Old characterizes Reformed convictions about worship as convictions which arise from the first four commandments. The first commandment directs that “our worship, our deepest devotion, our most ardent love is to be directed to God rather than to ourselves.” John Calvin drew on the first commandment the Christian's obligation “with true and zealous godliness... to contemplate, fear, and worship, his majesty; to participate in his blessings; to seek his help at all times; to recognize, and by praises to celebrate, the greatness of his works – as the only goal of all the activities of this life.” The abundance of the Christian's desire to serve and praise God is particularly expressed in the worship which takes place on the Lord's Day in the house of God. Old comments that the “single greatest contribution that the Reformed liturgical heritage can make to contemporary American Protestantism is its sense of the majesty and sovereignty of God, its sense of reverence and simple dignity, its conviction that worship must above all serve the praise of God.” I also want to draw attention to a commandment that does not receive much recognition in the context of worship, namely the third commandment. Old writes, “the third commandment tells us that were are not to use the Lord's name in vain. Vain means “empty.” The commandment teaches us to worship God sincerely and honestly, to worship God “in spirit and in truth,” to use the words of Jesus.” Worship is of first importance in the Reformed churches. It occupies the entirety of the corporate, public worship service. 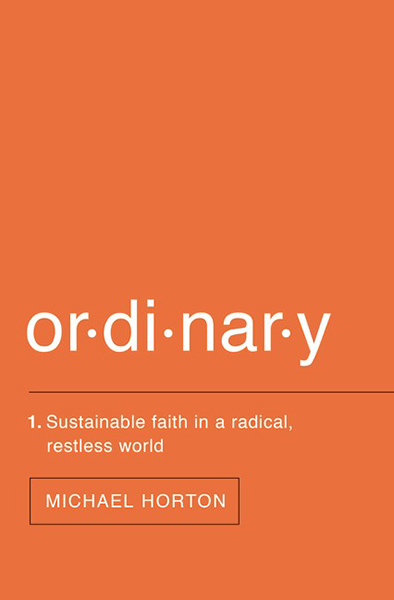 Michael Horton's book Ordinary: Sustainable Faith in a Radical, Restless World is a great read for every believer who is struggling to keep up with the demands of every new kid on the block with a new strategy to make us bolder and better Christians. I'd highly recommend Dr. Horton's message of finding life in the ordinary activities of the Christian life. We so easily neglect the most important means by which God builds our faith and nourishes our souls: His Word and the Sacraments (Baptism and the Lord's Supper).